When I was writing about my Nexus 4 receiving Android KitKat 4.4 update, my phone was getting the update right next to me. The update procedure somehow got stuck at the same screen for a long time, I got impatient and restarted my phone hoping that the install procedure would continue. Well big news: "We should never restart a phone while it is updating" and I should have known. My OS update didn't complete and I was stuck at the loading screen. I thought I bricked my phone, just like my last Motorola Droid (Milestone) but luckily this time, that was not the case. I managed to fix it partly because the installation process was almost complete. I knew it was almost complete because I could hear notification sounds in the background but without the display. I called my number using another phone, the call screen showed up. I managed to reach the home screen after disconnecting that call. It was all messed up. May be it was a problem with the custom launcher that I used. Since my phone was not rooted, I managed to back up my app data and apps using Helium. I backed up my photos, videos and other media by copying it to my PC using a USB cable. After backing up, I went to Phone Settings > Backup & reset > Factory data reset. After confirming to reset my phone, it restarted and wiped everything. After that, it installed a fresh copy of KitKat 4.4 or reset back to it. Who am I to know what happened in the factory reset procedure. That was it my phone was up and running. After installing a fresh copy of KitKat 4.4 in my phone, I set it up like a new phone. I linked it up to my Google account and that is when my phone began to automatically download all the apps that I had before. 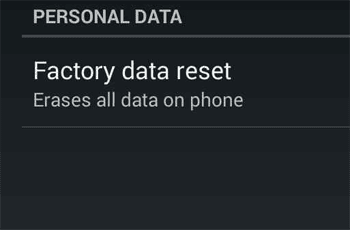 Turns out, if you checked the "Back up my data" and "Automatic restore" options available at Phone Settings > Backup & reset options, this happens automatically. After waiting for my apps to complete downloading, I tried running Viber but it asked me to set up the app with my number and everything. So, I understood that only my apps were backed up, app data (login information for example) needed to be restored. To restore app data, I used the Helium app once again and restored it from my PC including SMS messages. Everything went smoothly and I had my Nexus 4 phone with all my apps and their data along with KitKat 4.4.